You can change how the WordPress Dashboard looks by modifying the order in which the modules (for example, Right Now and Recent Comments) appear on it. You can expand (open) and collapse (close) the individual modules by clicking your mouse anywhere within the gray title bar of the module. The navigation menu on the WordPress Dashboard appears on the left side of your browser window. When you need to get back to the main Dashboard page, click the Dashboard link at the top of the navigation menu found on any of the pages within your WordPress Dashboard. The Right Now module in the Dashboard shows what’s going on in your blog right now — right this very second! The figure shows the expanded Right Now module in a brand-spanking-new WordPress blog. The next module visible on the Dashboard is Incoming Links. It lists all the folks who wrote a blog post that links to your blog. When your blog is new, you won’t see any incoming links listed in this section. The Plugins module includes three titles of WordPress plugins linked to its page within the WordPress Plugin Directory. The Plugins module pulls information via RSS feed from the official WordPress Plugin Directory. This module displays a plugin from two different plugin categories in the official WordPress Plugin Directory: Most Popular and Newest Plugins. The QuickPress module is a handy form that allows you to write, save, and publish a blog post right from your WordPress Dashboard. If you’re using a brand-new WordPress blog and this is a new installation, the Recent Drafts module displays the message There Are No Drafts at the Moment because you haven’t written any drafts. As time goes on, however, and you write a few posts in your blog, you may save some of those posts as drafts to be edited and published later. Those drafts show up in the Recent Drafts module. The Recent Drafts module displays up to five drafts, showing for each the title of the post, the date it was last saved, and a short excerpt. A View All link also appears; click that link to go the Manage Posts page, where you can view, edit, and manage your blog posts. 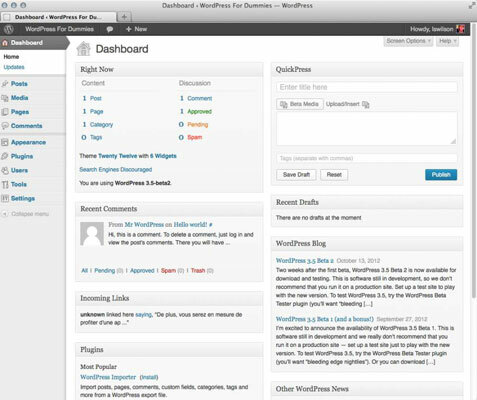 When you first install WordPress, the WordPress Blog module is by default populated with the two most recent updates from the official WordPress blog. You see the title of the last post, the date it was published, and a short excerpt of the post. 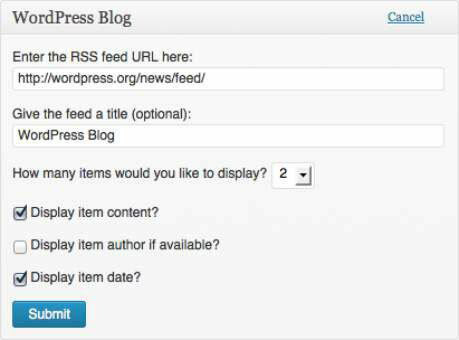 Click a title and you go directly to that post on the WordPress blog. 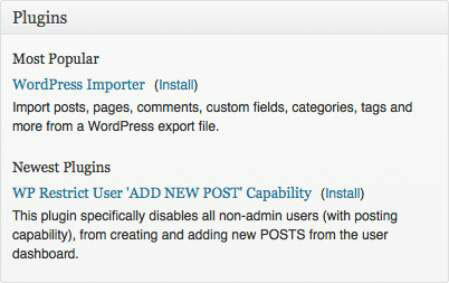 Although you might want to keep the WordPress Blog updates in this module, the WordPress platform lets you change this module to display posts from another blog of your choosing. 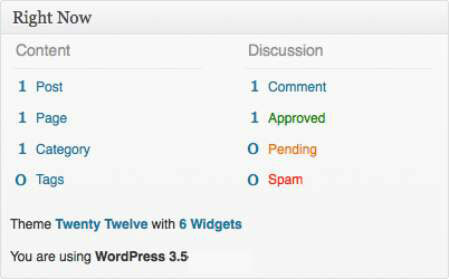 The Other WordPress News module of the Dashboard pulls in posts from a site called WordPress Planet. By keeping the default setting in this area, you stay in touch with several posts made by folks who are involved in WordPress development, design, and troubleshooting. You can find lots of interesting and useful tidbits if you keep this area intact. WordPress is all about user experience, however, so you can change the options to specify what displays in this area. 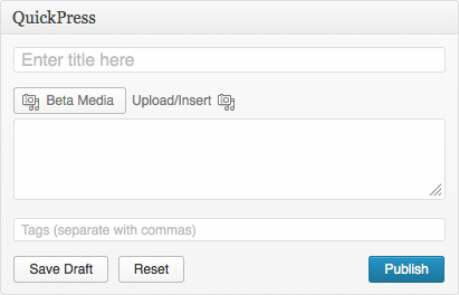 You can change the items in this module the same way that you change the options for the WordPress Blog module.